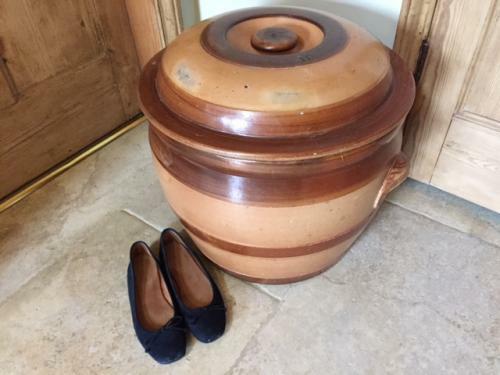 Giant size 10 victorian Ceramic Crock with Lid. Salt glazed with ribs of dark brown glaze. Marked Doulton & Co Lambeth. Very imposing size and wonderful to have the lid. Would be very striking in large kitchen, hallway or restaurant. Could be used to store dog food etc? Overall condition very good. Some minor hairline cracks but minimal.